David Meade Bamboozles the Sunday Life Newsroom. Sceptical by nature and cynical by design, the Sunday Life office is hard to impress – but that didn’t put off TV mentalist David Meade. Fresh from the hit BBC show that saw him win a million dollars from a Las Vegas casino, David popped in to the Sunday Life newsroom to showcase a little of what his audiences could expect to see in his sell-out 2015 tour. Just ten minutes in and David had successfully bamboozled everyone by repeatedly guessing what number reporter Patricia Devlin would roll on a dice. 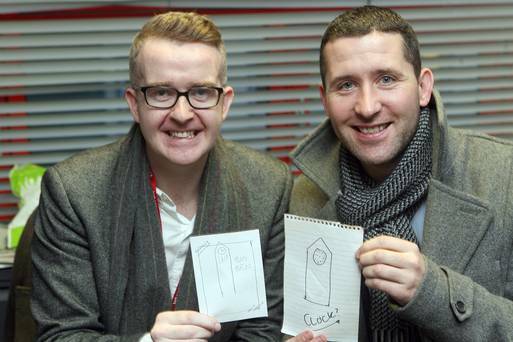 More impressive still was when David, with his back turned, managed to draw the exact same image, of London’s iconic Big Ben, as the tabloid’s Chief Reporter Ciaran Barnes. The most cynical about David’s skills out of the entire office, even Ciaran had to admit the mentalist was “very impressive”. So as the mentalist’s 2015 sell out tour comes to a close, what do his fans have to look forward to in the future? Stay tuned for David’s 2016 tour dates – to be revealed soon.